You can see, the green really is almost done! I think one more day to fit the rest of the tiles and then cement them all in. Here’s the closeup view. You can see there really is a very small space left to fill in with green. This is going very slowly. (Compare the photo above to the one six days ago.) The space is very confined, so practically ever tile is being cut and ground to fit. Most of them take 10 to 20 minutes each to do this. 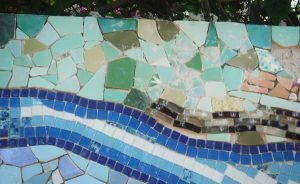 The plan is to finish the green, and then GROUT all the way up to the sand-bottom border, and then work on the sand after that. The grouting could go smoothly or have problems from one end of the wall to the other, but it’s time to find out. Next page: 20 June–Ocean tile done! This morning I cemented the top row of tile all the way out to the end! I think there is now less than a 2-square-foot area of water to do, and then just the sandy sea bottom. If it looks like I can’t get it all done before we travel again July 7, then I may do the grout all the way up to the gold line of tile that defines the edge of the sand. 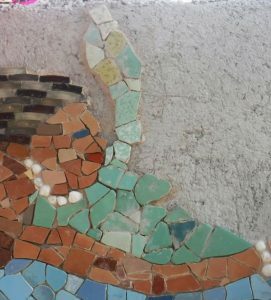 The grouting is going to be very interesting, since the tiles have such a wide range of thickness and the gaps between them go from zero to maybe 1/8″. I do not have good feel for how it will look at the end. Next page: 19 June–One more day? Remember when every day (back the end of March) my post was nothing more than “More blue tile”? That’s about where we are now with the green. I should have lots of material to finish the ocean, in several different shades of green (but especially that Plain Old Pastel Green). Some folks even surprised me by bringing some over yesterday! I’m in fine shape. 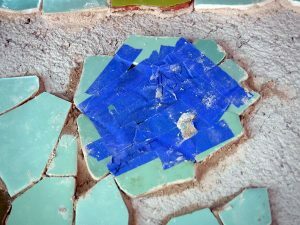 So the last several days have been the same slow process of finding a tile that almost fits a place, chipping and grinding it, and taping it up. Then once a day, mixing up the cement and sticking them all on the wall. The above photo is the recent work as of 12 Noon today–notice that the entire area above her is now completely filled in! But there was one unique little project this morning. 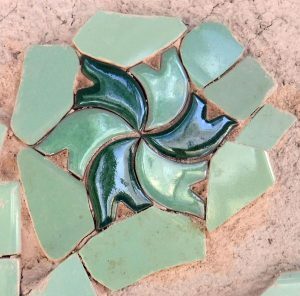 At the gift shop of the Alhambra in Granada, Spain, we bought a little coaster made from six pieces of ceramic tile, molded and arranged into a pattern actually found on some of the walls there. I taped the faces all together and then stripped off the piece of felt that was holding them into shape. I was going to put it on the wall and then get tiles to fit around it, but realized that would take forever and with questionable success. Instead, I laid it on the table and fit tiles all around it. No climbing up and down the ladder! The whole thing took about a half hour. After taping it all together so it could be handled as one piece (just as I did five months ago with Sirena’s body), I cemented it in place as you see here. The tape is off and you can see the pattern! Back from five weeks in Europe, and there’s some pretty inspirational tile work out there. 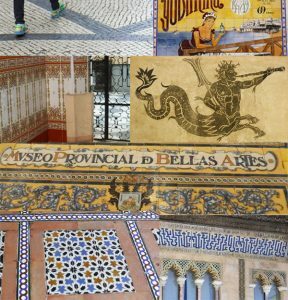 Portugal in particular is very well known for paving its pedestrian walks and plazas with black and white mosaic tiles, and the Andalusian cities of Cordoba and Sevilla have tile walls and decoration literally every place you look. Returning home the first issue to deal with was the same one that existed in April: the lack of enough pale green tiles. So I put a request out on our local expats Facebook group. Unlike my try several months ago (it was blue tile that time), I got several responses! It took a few trips out to the other beach towns, climbing around construction sites or combing piles on the playa, but I now should have more than enough to get this project finished. Today was my first day back at work on La Sirena, and the result is here. I’ve selected, cut, grinded (ground?) and taped up about 50 pieces to be cemented on the wall tomorrow morning. Anyway, we’re on a roll again. 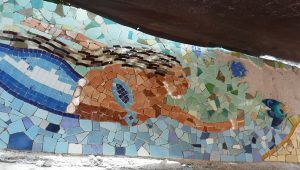 We travel again in 5 weeks, and when we return it will be the rainy season, so it would be really nice to have the mermaid done. Let’s start off focusing on the bulk of the work of the past several days. It’s very slow right now; a combination of working in the small curving space above her body and the lack of tiles to choose from. Those two things mean it takes a lot of time to find an appropriate tile, a lot of clipping and grinding to make them fit, and a LOT of trips up and down the stepstool. Still, you can see I’m very close to having the entire area above her body filled in! And there is more done out front of her as well (see photo below). 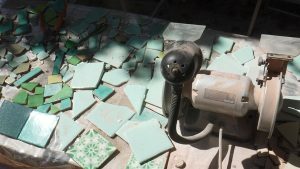 I broke down and bought some tiles at the Mexican-style tile store in Merida. There are several colors here, and I bought one pattern that you can see in the photo. 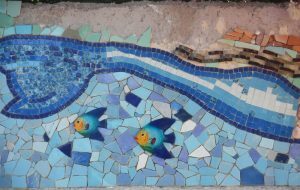 Notice that none of these are soft pastels; Mexican tile is known for its bright colors! So now the question: is there so much color up there that Sirena is getting lost? Lots of colors; lots of small tiles in a multitude of shapes. Hopefully when it’s all cleaned up and grouted it will all be fine. Here she is as of the end of April 17. I have at the most one more day of work before our long trip! Next page: 4 June–We’re back! Not much to add the past couple of days; we’re now really focused on preparation for travel, so Sirena is not getting much attention. The big work yesterday and today was this relatively small area of green tile. As mentioned before, it can be several trips up and down the stepstool to fit each one. Fortunately, the cementing in goes fast. Lots of area filled in at the left, and the top row is almost complete all the way to the air bubbles coming up from her mouth. Nearly all of those top-row tiles are only attached to the wall part-way up, so I have been packing finger-fulls of leftover cement behind each one a day or two after mounting them. I’m hoping that will create a solid back for them. You can see all the area still to be filled in out front of her to where the beach rises. But here on the table is ALL the green I have left. Tomorrow we will probably head into Merida and I’ll try to buy some more, hopefully in some different shades and especially in pastels. Hope springs eternal! Next page: 17 April–Too much distraction? You can see more green tiles are up, but it’s going very slowly–all those trips up and down the stepstool really do slow me down. At this point we’ve given up the self-imposed deadline of April 20 (when we leave for five weeks) and that takes the pressure off. I realized I’ve never posted a photo of one very tedious part of this process. 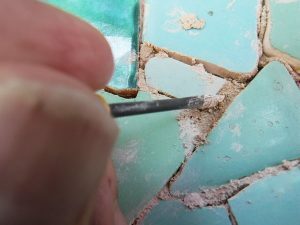 Practically every single tile has excess cement that has oozed out the edges, and we don’t want any of that to show; there always has to be enough depth for the grout to fill up. So when I’m not doing something else, I go out to La Sirena with my little picking tool (actually a soldering thingie that came with my Radio Shack soldering iron) and scrape out the excess. It comes out pretty easily (hopefully that doesn’t mean the adhesion is weak as well) and looks a lot better when it’s done. We’re full-bore on GREEN now! I may still drop a few blue tiles in at the transition behind the large fish, but I’m basically into the whole “above Sirena” green part of the ocean. I did have some special fun this afternoon. For weeks, you’ve seen a couple of tiles taped out in front of her mouth. Those are little “bubble” tiles; they have a bubbly pattern in the glaze. I’ve been hoping to have enough of those tiles to create a column of bubbles all the way to the surface, and today I decided to track them down. There was a lot of blue masking tape used to get those to stay up there, but amazingly little cutting and grinding to make them fit together! I figured the tape could easily give way overnight, so I mixed up a batch of cement and stuck them up there. I did some work in the area above her arm too. That’s filling in pretty nicely. 2 April–Under-tail done at last! That whole big blue area under the curve in her tail is finally done. Seems like forever since I started that! I like the two fish in there, but they sure did not make the job any easier, since a lot more fitting had to be done. Still, if you zoom in (use Ctrl + to do that, then Ctrl 0 (zero) to bring the screen back to normal), you’ll see they fit in there pretty well. SO now the only blue left is way out on the right side! Lots of cutting, grinding and blue tape today. Whoa! 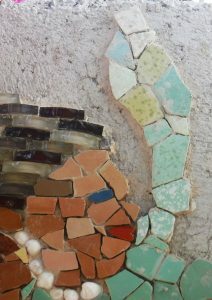 This morning I had the idea of putting something other than just tile in the large area under the bend in her tail. It’s a LOT of blue, and with the tail being blue already… you get the idea. 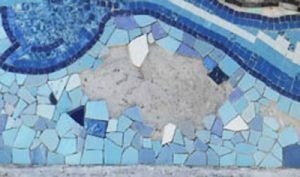 The obvious idea was a fish, but that would be hard to make with the broken beach tile. 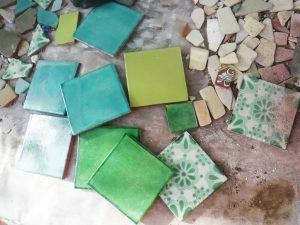 But–Great Idea–that kind of ceramic painted wall decoration is sold all over the place here in Progreso (we are a cruise ship port after all). 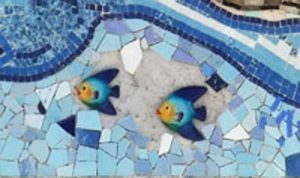 It did not take a lot of shopping to come up with a set of three ceramic painted angelfish (for about US$12), so we brought those home and tried them in different positions. 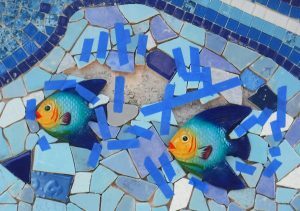 At this moment in the midafternoon, you can see the three fish, the starfish, and a bunch of taped up tile that will finally completely enclose the area under the center of her body. (That was actually the goal for today before all this other stuff started.) I’ll go back out there when I’ve got some shade again. … including some right around the two small fish. Compare this photo with that very first one at the top of the post. Not much gray concrete showing anymore! Hope to cement all of these in tomorrow. You can see quite a bit more area filled in under her upper body and arm, too.